What happens when we sleep? 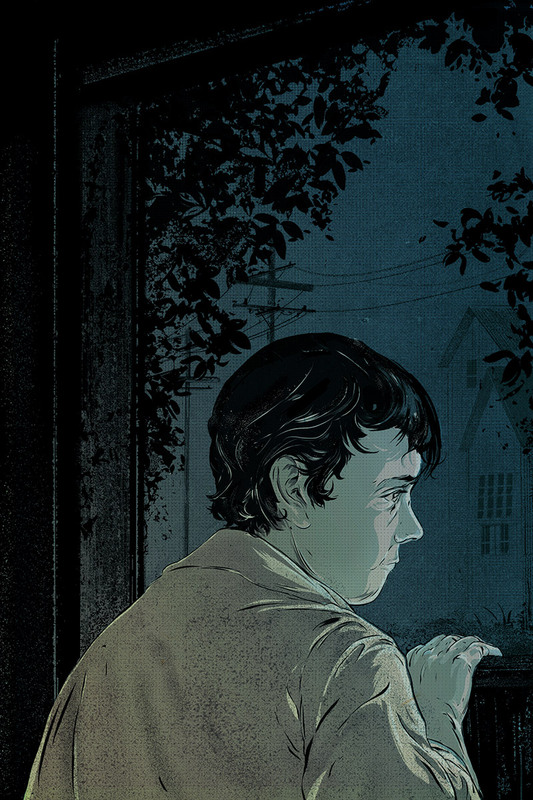 Ethan Chapman’s chilling short story explores one of his childhood fears. Illustration by Jude Labuca. Though I know it’s just the two of us, some mornings I wake up and expect to find them there. I can’t help it. Before school, I’ll go into their room and breathe in the smells of them. My mother’s sweet, fruity perfume that still clings to her pillows and my father’s coat that hangs in the cupboard, reminding me of trips out in the car with him. In this way, I keep them alive though the scents feel like they’re fading along with the images. Threads of memories disappearing. Sometimes I’ll turn around and find my sister standing in the doorway watching me. Her eyes will be bright and I’ll know she understands. We’ll get ready, then step outside, and I’ll look at the houses and the gardens and think how strange it all is now. The things that we were so used to hearing — the sounds of laughter, the echoes of cars, of lawnmowers, of motion — are now replaced with nothing but silence, and the sound of the sea that sometimes reaches us from the other end of town. We’ll walk past gardens becoming overgrown and houses that are empty. Sometimes we’ll see the faces of children looking out at us and we’ll smile or wave. Sometimes they’ll do the same; sometimes they’ll just stare at us. We’ll get to the corner of our street, where the bus used to pick us up, and we’ll wait there, just to see if it will turn the corner and come back into sight. I’ll glance at my sister and see the hopeful look in her eyes as she leans out, just to see. I guess both of us are still hoping, waiting for something, waiting for our lives to reattach themselves to what they were somehow. To bring things back to what they were. But the bus doesn’t come and I know that it will still be parked at the back of the school where it’s been sitting for weeks. One afternoon, while my sister played with her friends in the playground, I sat silently inside it with a few other students, my eyes closed, pretending that everything was back to normal. Pretending that I was sitting next to my sister and we were riding from one street to the next on the way to school. Pretending that everything was as it used to be. I must have dozed off because when I opened my eyes, my sister was sitting next to me and, for a brief second, I thought that all of what had happened was a dream. I quickly looked around, hopeful, then saw the fence around the yard and the empty faces of the students, and sank back into my seat. My sister asked if I was okay then touched my shoulder as I tried not to cry. After we’ve waited for a couple of minutes, I tell my sister we better up the pace if we don’t want to be late for school and then she smiles at me. I’m glad she can still smile, even now. She knows there’s no need to hurry. She knows, like I do, that the teachers are all still gone. Our parents seemed to disappear gradually. One night, I woke to the sound of giggling. I looked across the room and expected it to be my sister, but the silver beam of moonlight falling into our room illuminated her face and showed that her eyes were closed. I thought perhaps it might be from the tail end of a dream, some sound I had carried with me into the real world. Then I heard the front door open and shut, and I froze. I held my breath, afraid. I didn’t make a sound. I felt my heart begin to race as I imagined robbers coming into the house, murderers, all kinds of things from the night. I waited for them to come upstairs. I tried to think what I would do but I had no idea. I worried about my sister and my parents. I imagined them being taken away. I closed my eyes and wanted it to be over as quickly as possible, cursing myself for being so cowardly but feeling overwhelmed and defeated by all that was going through my mind. Then I heard that giggling again. It was coming from outside. I knew it was real now and I also knew it was my mother’s. I looked at the digital clock, its red digits floating in the darkness, though I’ve forgotten now what time it showed. I took a deep breath then got up and crept past my sister to the window. Looking out, I saw two figures crossing the garden. When they reached the streetlight, they stood under it and held each other, and I saw our parents illuminated in the glow. It felt strange to see them like this, out there in the darkness. I wanted to call to them, to ask them what they were doing. I saw my mother turn and giggle again, then my father take her head in his hands and kiss her. Then, holding hands, they walked towards the end of the street. I didn’t know what to do. I felt alone and unsafe. I wanted to follow them. I felt like I had somehow looked behind the veil of something that I wasn’t supposed to. I wondered how long they had been doing this. How long had they been leaving us? I felt responsible. I wanted to be awake, to take care of the house in case they came back, for me to know they were alright. I tried to tell myself there was an explanation, that there was nothing to worry about. That all this worry was for nothing. So I went back to bed and closed my eyes, trying not to fall into sleep as much as plunge into it, hoping that everything would have rectified itself in the morning. When I did wake up the next morning, I ran to my parent’s bedroom. I saw the bed made and empty. I raced downstairs where I found my father sitting at the kitchen table, eating toast and drinking coffee. I saw my mother standing beside him, reading the newspaper as she waited for her own toast to pop up. I felt relief flood over me. I looked at them, acting as normal, and wondered if perhaps I had dreamt up the whole thing. My father looked at me and smiled, then fixed his gaze on me and frowned. I told her what I had seen. I watched her look at me, hurt and suspicious, and felt I had broken some sacred trust between us. I realised I had betrayed her and when I apologised, she didn’t say a thing. We checked every room at least twice. We checked under beds. We checked the shed. When Alice started checking the cupboards and drawers, I tried to reassure her, told her not to worry and that they would be here by the time we got back from school. All through the day I hoped things would magically reassert themselves by the time we arrived home. I felt they would, felt for sure that they would be there, until we opened the door and discovered that nothing had changed. ‘Where are they?’ Alice asked, her eyes shining with worry. ‘Why aren’t they here?’ The next morning they still weren’t back. ‘Should we phone the police?’ she asked, becoming increasingly frantic. I told her that I didn’t know. It was the truth. I didn’t know what to do. I wanted to phone the police to put something in motion, to bring them home, but I also didn’t want to because it would validate that something was seriously wrong in our household. I felt we were isolated in some little corner of the world, like we had been pulled back and then thrust, slingshot- like, into this strange place where things didn’t make sense anymore. In the days after that, the house felt peculiar. It felt big and unwieldy and missing pieces. We sat and continuously checked the windows for their return. We sat hopeful and expectant and despairing. When it got dark, we would look outside and see the movement of the shadows, wondering if that movement was our parents or something else. One night my sister got up and went to the kitchen, and it was a while before I realised she hadn’t come back. I felt panic needle into me. I went to the kitchen and found it empty. I raced to the back garden, fraught with visions of her disappearing too, until I found her standing at the edge of our patch. ‘I thought I saw them,’ she said when I stood next to her. She stared off into the distance where we could see the lights of our town still shining, and the darkness of the sea just beyond. We went to school in a daze. We felt grey and sick and isolated. We drifted in and out of lessons, and in and out of the day until it felt like we were existing between worlds. Things took on an elastic sense. Life felt light and transparent. We were like ghosts, spirits not occupying any space. Our lives felt just in front of us, trapped behind a screen, until we noticed other children looking the same. Grey and ashen and quiet. Seemingly overnight, it had afflicted us all. We saw their sleepy expressions. We saw them falling asleep in class. We realised it wasn’t just us, that we weren’t alone in this, that we all had been affected by this parentless disease. Then one day, we looked up and found the teachers gone. We had no idea when they had. We looked at one another and asked when it had happened, though none of us could be sure. In those first days, we would come to class and wait and keep waiting, still abiding by the rules until the bell rung, which still rings even now. We would sit and wait until one of us would begin packing their things away, and the rest of us would look at each other and do the same. We realised then that the restrictions had been lifted, and for a while we felt loose and untethered. Much the same as we do now, except we’ve become used to it. When Alice and I get to school, we say we’ll see each other later then meet up with our friends and mingle in classrooms. We go out to the playground and the sports hall and the science block. Some of us leave and then come back. Some of us leave and never come back. Nearly all of us have stopped wearing uniform. A few still do but we don’t judge them. We understand why they do it. We understand their need for routine, for hope. Time has become slack, the timetables forgotten, though none of us stay past three. We think of how things used to be. We see books stacked on shelves that now have no use. We see teacher diaries and look through them, sad that they had plans for us, plans that will never be fulfilled. We see tossed wrappers in bins and wonder when they got there and how long they will stay. Initially, I had thought that, with the adults now gone, we would impose rules on each other. That the kids would turn savage like they had done in the books I had read. That something would trigger inside them, some primal impulse, and we would start bullying each other and fashioning dictatorships. But we didn’t. We’re still the same children. We’re just lost and scared. We weigh less now, a little less sure of ourselves. After it happened, we still held out hope of finding them. We would grab our coats and wander out through our neighbourhoods looking for them. Alice and I would silently join kids we knew from school as we searched high and low for them. Some of us, the bravest ones, checked tunnels and the far reaches of town. The fields, woods and corners that were previously hidden to us had now been revealed. In this way, we felt we came to know our town better, exploring it and understanding it — though in truth we didn’t understand it at all. There were rumours that they had gone underground, that one kid had found a garment belonging to his mother at the mouth of a cave. There were rumours of sightings, of adults sometimes being seen out of the corner of children’s eyes, stopping, staring. But nothing was ever confirmed and nothing ever came of it. Back then, it wasn’t unusual to walk past kids crying outside their houses; shouting for their parents, walking around dazed and confused. We walked past them sitting against their front doors. We walked past them throwing things through windows and climbing in. There was a strange, quiet sense of anarchy about the kids in our town in those early days. A gentle, bubbling sense of confusion and chaos that could only simmer. Now, weeks later, things are quiet. An acceptance has set in and we smile at each other as we ride or walk past. In a sense, we have become the adults, even though our town is only occupied by children. One evening, I’m awakened to the sound of giggling. I feel a strong sense of déjà vu until I realise the giggle is from a dream I had been having of my parents, though the particulars are dispersing now and there’s nothing much to hold on to. I look over and find my sister’s bed empty. Outside, the evening sky is beginning to darken, yellows turning to oranges and reds. I get up and search around the house with a sinking feeling that I’ve finally been left alone, that what I’ve been afraid of has come to pass. I put on clothes over my pyjamas and race out into the night. I have no idea if I’m going in the wrong direction or if she’s even out here. It crosses my mind that perhaps she’s still in the house, that in trying to find her I’ve in fact left her, until I see a familiar figure walking in and out of sight on the pavement between the overhead lights. She nods and says that she’s sorry and then, side by side, we walk down streets made strange in the darkness. I have no idea what Alice wants to find out here, whether it’s our parents or whether it’s to feel what they felt in the nights leading up to their disappearance. I have no idea if it’s to punish me because she still blames me for not telling her until it was too late, for being the last one to see them. I don’t know and I don’t ask. I want us to be close and there for one another. I don’t want us to pull apart and I wonder, perhaps for the first time, what will happen to us as the years go by. As we walk, we realise we’re not alone. We see kids we know drifting along, lost. As we get closer into town, more of them appear. Kids we know from school and kids we’ve never seen before. We walk in and around them. Some of them shout for their parents. Some of them whisper. Some of them cry. They look at us and smile or nod while others just look at us and then look away. When we get to the beach, it’s almost completely dark, and we stand by the railing, watching the moonlight glinting off the waves. I feel the breeze coming from it and I shiver. A couple of kids are standing next to us with their heads in their hands. Others are hugging each other, perhaps from the cold or from something else, while others just sit on the sand and stare out at the sea. Further up, we see an ice cream van seemingly abandoned but with the lights still on. Children walk past it and then stop, enticed by the light or perhaps with a childish memory taking over. Some of them start reaching for change, forgetting the world they live in for a brief moment, before they remember and put their hands back in their pockets again, walking on. After a while, we look at each other and then we turn to walk back home. As we do, I wonder if any parents are left. I wonder if any of them are alive and, if they are, what do they feel about us? Do they think of us as we think of them now; something slowly losing focus as time goes on. We get further out and the number of kids starts to lessen. We begin to walk through streets that are completely empty and I think how easy it is to forget that there were ever any adults here. The memories of our parents seem to be vanishing, day by day. It’s harder to catch hold of them. They fall through my hands and it saddens me to think that one day they may be gone, all of them forgotten. I wonder if Alice feels the same and then I think about us. As we grow older, becoming adults in this town, I wonder what will happen. Will we move out? Will we start families of our own? Or perhaps we’ll disappear, much like our parents did, leaving the children of our town to fend for themselves when the time comes for us to be children no more.